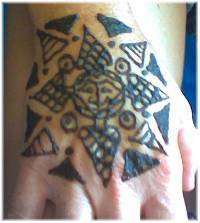 Creation Of Tattoo: Tribal Sun Henna Tattoo for back of hand! Tribal Sun Henna Tattoo for back of hand! I have one client that really loves sun tattoos. This tribal sun design happened on a Saturday afternoon at KooKoo Bean Exotic Imports in Jacksonville, Florida. More tribal henna will be showing up soon.